In impound, after our 200 mph Bonneville record run, Tom Evans, the head SCTA-BNI motorcycle inspector, uses a pneumatic cylinder to check the Bullett's displacement to verify it is legal in the 3000cc class. At the 2011 World of Speed event Bryan Stock took the Bullett for back to back 200 mph runs to go into the Bonneville record books. We thought it was a good idea to cruise at 4800 rpm and get a 200 mph record, which we did. Bryan backed up the run @6000 rpm in 4th gear. We then turned the boost up to 18.6 psi the last day, and buzzed the engine to 6100 rpm trying for 230 mph and damaged a rod bearing. The weather was clear skies with little or no cross winds and the salt was pretty good but rough so Bryan got bounced around quite a bit. One motorcyclist crashed and had to be flown to Salt Lake City which shut the event down for awhile as we had to wait for the ambulance crew to return. A second competitor or crew member had a heart attack near the start line and the event was on hold again until the ambulance returned. Next up will be Bonneville in 2012 and we'll be shooting for 230 to 250 mph with better rod bearings and more advanced control systems. Here's a chronology of the 2011 WOS event. As usual Bryan Stock drove to Bonneville on his chopped Harley Road King. Pulling off the access road onto the salt there was no water which is always a good sign. The salt looked a lot better than at Speed Week where it rained on Saturday night before we ran. The course turned out to be pretty good, but rough with some soft spots. The course was shut down and moved once after the motorcyclist crashed and was medi-vaced out to Salt Lake City. Arriving early on Tuesday morning the salt did not stick to our shoes which is always and good indication of two things: (a) traction will probably be OK and; (b) cleaning all the crap you brought, like a race trailer, will be easier. Here Walt Henning stares in admiration of Tom Evans' one legged inspection technique. Tom does not cut anyone any slack but we got by without having to do any more additional safety wiring..or any corrections for that matter. 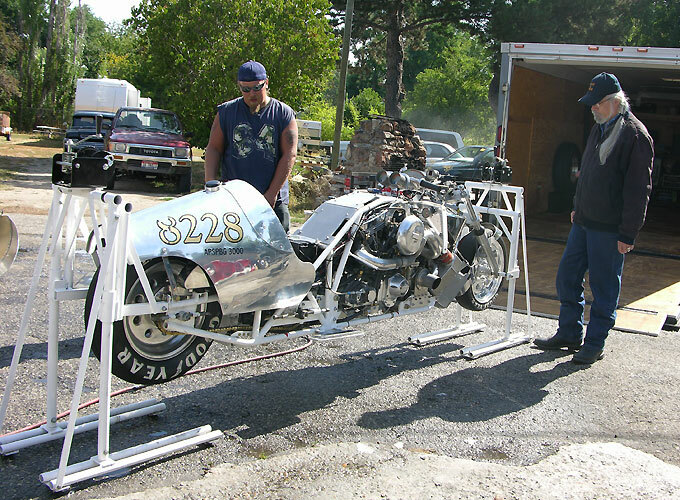 It is advised you get your gear and your bike to any Bonneville inspection early as it can take quite awhile. Any bike capable of 200 mph plus generally will require two inspections with the senior inspector, like Tom Evans, giving the final OK.
We had gas in a previously inspected and sealed container so Tom let us fill the Bullett's gas tank which he re-sealed. Once the tank was filled Tom sealed the Bullett's tank. If you break the seal you will not get a record as you can only used the fuel supplied at the event. Only a SCTA-BNI official or the racing fuel truck can seal the gas tank. The Bullet is back where it belongs. It's handlers are far, far, away from their homes. Money sucking missile that looks for brief glory then hides another year while its handlers recover from domestic, business and other issues. Ballerinas have bloody toes. Bryan Stock suits up with his red 'Kill Switch" tethered to his leathers should he become separated from the bike enroute. Nick holds Bryan's sunglasses because he will be headed directly into the early morning sun. Nick Stock secures the helmet strap and checks all the safety gear to include the final visor closing just before Bryan leaves the line on his run. Mark will start the bike via a push button on the starter motor as soon as Nick activates all the electrical switches. After a 200 mph qualifying pass the Bullett goes into impound. If you have beaten an existing record you have to go directly to impound after you pick up your timing slip. Bryan elected to go for an easy pass to secure a record just over 200 mph. After that we would up the boost and wind the bike out to 6000 rpm if we were successful. You have four hours to work on the bike. Tom Evans put a "time in" sticker on the bike. No engine changes are allowed (fat chance)..Only four hours to make repairs and do maintenance. We were good for two runs on the gas tank so we left it sealed. Errata: We shredded the right rear tire of the small trailer just before we got to Wendover and mounted the spare. Brother Speed's Blaine drove in two new tires from Salt Lake City bringing his son Austin with him...240 mile round trip and a Casino buffet dinner. Since you meet all sorts of interesting people at Bonneville we were talking to a competitor who turned out to be an accident investigator. When we told him we peeled the tread off our trailer tire on some new asphalt between Wells and Wendover he said it was due to an older tire and the higher coefficient of friction on freshly laid asphalt. According to him the coefficient of friction on new asphalt is about .85 whereas older worn asphalt is about .63. The additional friction and heat doomed the older tire. There is all sorts of help or information floating around and the people are helpful and friendly at Bonneville...no barriers or tapes, save for safety purposes. You get up at 5AM, grab a quick Casino breakfast and head for the Salt Flats and go directly to the impound. The pits and the impound area are about 4 miles down course from the starting line. Bryan and Mark ride their Harleys in from the hotel. Driving in in the early morning light is a unique experience. The washboarded surface just off the access road removes any loose nuts and bolts from your Harley. Arriving at impound it's time to uncover the Bullett and get her ready for the return record run. The USFRA Officals will lead us out of the impound at 8 AM. Bryan warms up the engine in the early morning light as we will probably be about the first to go down the course. The weather forecast for Friday was high winds and rain so on Thursday morning Bryan had to ease the Bullet down the course to backup his Wednesday 200 mph record breaking pass. Weather at Bonneville changes quickly and we had to take advantage of the near zero side wind conditions. The decision was made to buzz the 139 inch motor in 4th gear to 6000 rpm as Bryan had to be at 200 plus well before the 3 or 4 mile markers. We also needed some data for 6000 rpm as he had previously cruised in 5th gear at 4800 rpm at over 200 mph. Bryan knows what he has to do so there isn't any discussion about the run. He has to manage a sintered iron slipper clutch on a bike geared for 294 mph @ 6400 rpm in 5th gear on a bike that weighs 1000 lbs with 45 degrees of rake...sort of like easing your street bike off the line in 4th gear while laying down on your stomach with your arms stretched out. If they let him, he'd drive it back to the pits...He once drove the bike through slushy salt in figure eights on a video shoot for $200.00 and all the beer the crew could drink. Nick arms the electrical system after hooking up Bryan's deadman tether. Mark will push the starter button on the right side of the bike when Nick gives him the OK. After that it's up to the USFRA offical starter and Bryan. When the man says go, you go. There is no one else running. The only race vehicle on the great white expanse is you. You are the show. Bryan is heading down a new course he is not familiar with as, due to an accident the day before, the course was moved to the right the night before. At the end of six miles Bryan breaks the record on a backup 200 mph pass and goes directly to impound again where Tom Evans has to verify the fuel, the engine and everything else. In this case everything went smoothly and Bryan went into the record books with two 200 mph passes. Some people have been trying for 10 or more years to get a 200 mph record...Bryan did it in three. Bryan hit his mark at 6000 rpm in 4th gear and with 10% wheel slip and the Bullett bouncing on the rough salt. He got the record. Mike finally made it to the salt to see his bike run after his accident in 2008. Many people know Mike from his earlier #226 Blue Bike or who have followed the Bullett's construction and early trials on the internet. Mike got to talk about the Bullet, meet old friends and be at the event where Bryan got the 200 mph record. The USFRA World of Speed Event was always one of Mike's favorite events as it is much smaller than Speed Week and the weather is generally much cooler. Here Mike is discussing the Bullett with a couple of gentlemen who wanted to meet Mike...They had stopped by the pits before Mike arrived at Bonneville. They wanted to ask about the Bullett and tank warfare in Viet Nam, both subjects Mike is familiar with. Everyone at the Salt Flats wanted to know who did the spectacular bodywork on the Bullett. Well, in short, Mike and Bryan did. What they started out with was an F4 Phantom Viet Nam era wing tank. Lots of work. The work doesn't stop after you have a 200 mph record. The bike has to be cleaned and stripped to prepare it for next year. Nick uses a pressure washer and an air hose to clean the Bullett. Mike looks at his 20 years of work. It's all sort of anticlimatic...then you dig in and keep going because the clock is ticking for all of us and 2012 is just around the corner. The bike works and is about to unleash its potential. Standing over 10 feet tall and restrained by high strength tethers and titanium stakes, this Wild Bonneville Chicken is kept near technical inspection. We guess frontier justice is metered out to offenders of Bonneville etiquette. Harlan seems to have gone too fast in the pits. World's fastest Velocette...from the Salt in Australia to the Salt at Bonneville....Pukka Pukka Megaphone sounds on the Bonneville Salt Flats. BYU (Brigham Young University) has about seven years of student-engineer training and construction into this vehicle. Since we've forgotten how to make Saturn 5 rockets this may be the future. No more small blocks or big blocks. No more nitro...only silent electrons. We think this "gas tank" / power source provides an unfair advantage. Jon Minonno has been racing motorcycles for a long time..everything from flat track to road racing, and has a long, long, history at Bonneville. Jon made a one-way pass on double engine Triumph @ 256 mph way back when. Here is his 100" S&S Pro Stock Pro Stock turbocharged Bonneville bike. John hit 218 mph but snapped a Bandit primary belt. It's a long drive from Texas. Jon stopped by our pits where we discussed broken drivetrain parts and our broken main bearings and a few other non-technical issues and history. We both agreed this was a fatal addiction...to your bank account. No matter how you test, Bonneville finds a way to break your parts...We know. Jon knows. Old two strokes always have a place on the salt. Here a 500cc two stroke in Bonneville attire gets ready to head out looking for a record. Ringa Ding Ding. We brought Mike Geokan's "Evil Twin" FXR out to the salt for his first visit since Speed Week in 2008 due to two accidents. Mike got to ride his FXR around on the Bonneville Salt Flats to return to the place where he still holds a record on his old #226 Blue Bike. Bryan Stock has taken over riding duties on the Bonneville Bullett.